At Pukka Software, we are big fans of open source. We use Wordpress to power our parent site because it's easy and powerful. To share some love, we've developed plugins for Wordpress and Joomla to query, cache and display driving and social event listings on any Wordpress or Joomla site. Customers on our Premium plan are entitled to embed their event listings inside their own website, tailor the fields and look and feel simply by installing our plugin. You can find our open source projects and free code on Github. Wordpress: This is for any organization using Wordpress 2.8.5 or newer to run a site or blog. It will require the ability to upload files to your /wp-content/plugins folder and activate the plugin in your Wordpress Admin. No programming skills required. Joomla: This is for any organization using Joomla 1.5, 2.5 or 3 to run a site or blog. It requires the ability upload and activate a component. No programming skills required. Begin by downloading the plugin and extracting the files into a folder on your Wordpress server where you store your other plugins like wp-content/plugins/msr-calendar. In newer versions of Wordpress, you can upload it directly into the administrative interface under the "Plugins" menu. The Joomla process is similar to Wordpress. Begin by downloading the plugin and use the administrative "Components" menu to upload and activate the plugin. To add the event calendar to your site, edit your menu and create a new link. 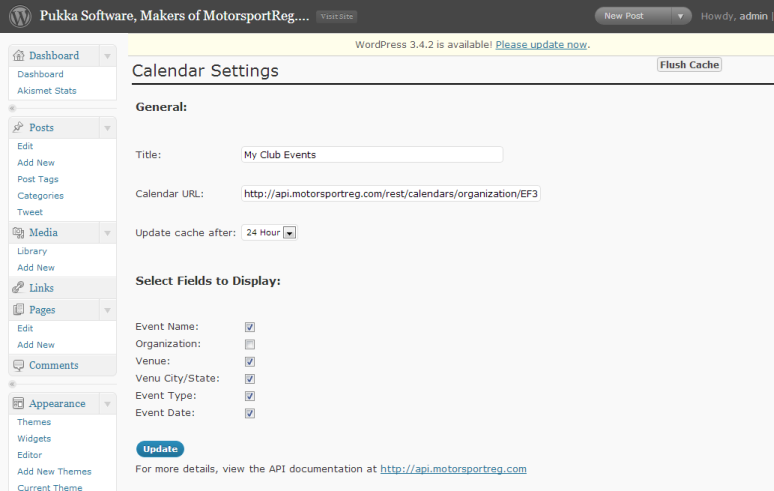 You will see a new "MotorsportReg Calendar" option to link to which will be your list of events. Calendar text for name, location, dates, etc. Use of our Wordpress/Joomla plugins have only one requirement: that you leave the footer link back to MotorsportReg.com unedited. Thanks and enjoy!